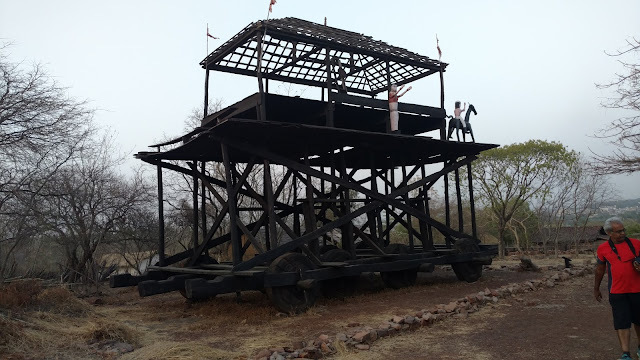 The day was reserved for local sightseeing in Bhopal. We were tired as well so we decided to rest for few hours in the day and then visit Bhim Betka. 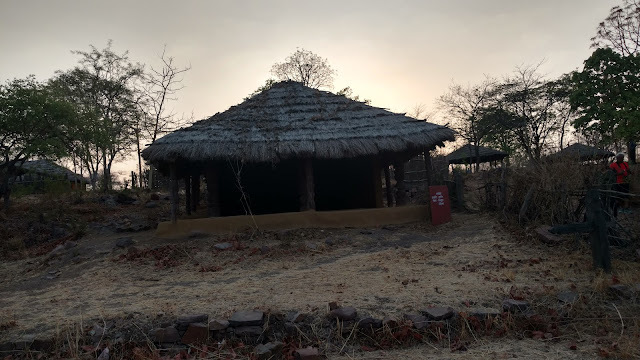 Bhimbetka is being inhabited from early days. To study the cultural development of human beings many excavations were carried out. 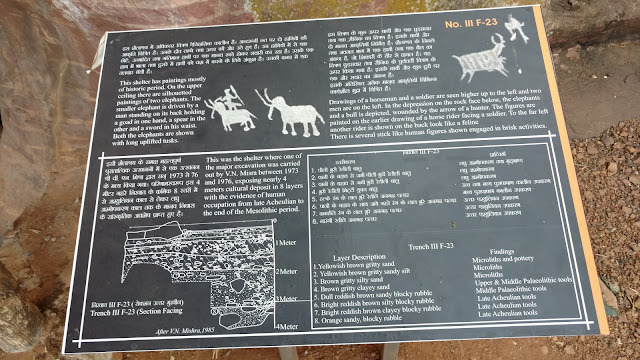 Summarizing the evidence from all the excavations the following cultural sequence emerges at Bhibetka. Evidence of pebble tool assemblage below the acheulian deposit with a sterile layer in between is a remarkable finding. There are a number of tools made on flat natural stones instead of flakes. The characteristic features of upper paleolithic period is the increase in the proportion of smaller and slender blades. The mesolithic people used micro lithic tools on siliceous material like chert and chalcedony. During this period maximum number of shelters and caves were occupied. It clearly shows increase in human population. The meoslithic people regularly used fire as is testified by the presence of ash, charcoal and charred bones and antlers. These people made floors with flat stone slabs and stone boulder wall to partition the cave into compartments. After the discovery of metal such as copper and iron, the hunter-gatherer way of life slowly tranformed to life on the plans to practice of farming. Bhim Betka displays paintings that appear to date from Mesolithic period right through historical period. The paintings show gradual development of social cultural life of man kind. The rock paintings of early phase comprises human and animal figures in line drawings. The rock paintings of Mesolithic period are demonstrated by hunting scenes these might have been a hunter gatherers. Most of the hunting scenes below to earlier phrase confined to Mesolithic and Chalcolithic periods whereas horse riding, elephant riding and ballte scenes which appear more refined are associated with Historical period. The colors were derived from locally available minerals such as ochre color from haematite and white color from lime. The corroborating evidence of the use of various mineral colors for paintings has also come from the various excavations at Bhim Betka. The binding medium used for pigments are both water and fixative like animal fat and plan extract like gum etc. In the presence of water and other solvents minerals get oxidised so as to leave their color on rock surface. Rock paintings are made on bare rock surface without any preparation of the base by plastering, grinding or smoothening. The naturally existing soft and smooth fibers, hair and fingers might have been used as brush so as to run on the uneven and unprepared surface of the rock. Figures at considerable heights were probably painted by artists standing on some soft of scaffolding or on branches of trees. In some cases projected platform as part of the shelter that might have existed and have since collapsed was used for painting at higher elevations. Sometimes the earlier painted srfaces were used several times by artists of later period(s) without obliterating the older figures. The superimpositions of such paintings of different stules and periods can be seen in many of the rock shelters at Bhimbetka. As many as fifteen layers of superimposition have been recorded at Bhimbetka. We reached Bhim Betka at 3:30 PM. The shelter has paintings mostly of historic period. On the upper ceiling there are silhouetted paintings of two elephants. The smaller elephant is driven by a man standing on its back holding a goad in one hand, a spear in other and a sword in his waist. Both the elephants are shown with long uplifted tusks. Drawings of a horseman and a soldier are seen higher up to the left and two men are on the left. In the depression on the rock face below, the elephants and a bull is depicted, wounded by the arrow of a hunter. The figures are painted on the earlier drawing of a horse rider facing a soldier. To the far left another rider is shown on the back look like a feline. There is several stick like human figures shown engaged in brisk activities. The mesolithic (C.10,000 - 2,500 years) people used to bury their dead within the caves in the living areas. The dead body was placed either in east or west. Stone querns, rubbers, antlers, bone tools, and hematite nodules were placed with the dead as grave goods. Usually the skeletons are found in disintegrated state. Zoo Rock shelter is semi-circular in shape and contains 453 figures comprising of 252 animals of 16 different species. Apart from animal figures, 90 human figures in several activities, 1 bird, 6 decorative designs, 2 enclosures idenfied as snares, 1 inscription in Sankha script and 99 fragmented figures are identified in the shelter. Except a few that belong to mesolithic period, most figures belong to the chalcolithic and historical period. The shelter is richly depicted with as many as ten layers of superimposed figures with raises curiosity about the significance of this shelter. The depiction of royal procession can be seen in the lower portions of shelter painted in dark ochre color. The horsemen and soldiers are shown with long hair and typical head dress. They are armed with bows, arrows, swords, and shields. The horse riders are accompanied by two drummers and a man carrying a staff. The mushrom shaped like shelter is known as Boar rock due to a gigantic figure painted on rock surface. The boar like mythical animal depicted with two crescent shalped horns, a massive snout with whiskers and bristles on the back. Near its snout, is the figure of a fleeing man and that of a crab. There are three human figures near its forelegs and a fourth behind its hind legs. 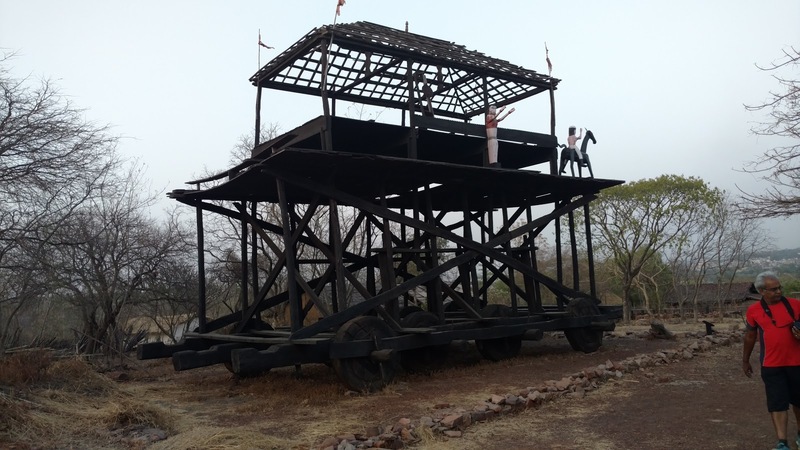 By the time we were done with BhimBetka, it was late, we still decided to make a run for Indiragandhi Rashtriya Manav Sangrahalaya. We reached there just when it was about to close for the day. Some pictures from that place are here. One needs more time to do justice to this place.